As regular readers will know, I’m a big fan of Islay whiskies. 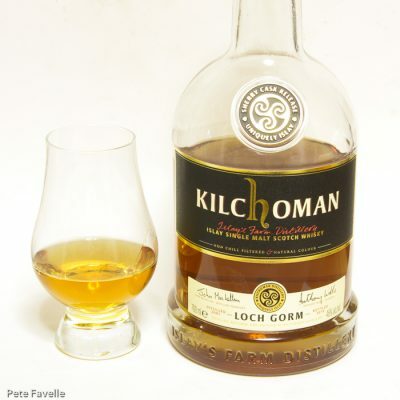 And one of my favourite distilleries on that island is Kilchoman. Established in 2005 and – for now – the youngest distillery on Islay, every year brings new whiskies to their range and every whisky tastes better than the last! Loch Gorm is their sherry-aged expression and is named for the dark, peaty loch that the distillery overlooks. Each year sees a new edition of the Loch Gorm, with this being from 2013 – the first year of it’s bottling. It’s a good looking, fairly dark whisky, although not as dark as the black packaging might suggest. The aroma is rich and sweet – raisins and overripe oranges, with cloves and iodine in the background. There’s a cold smokiness there too, like the ashes of yesterday’s bonfire. Watered, the grain comes through much more strongly and the fruit is replaced by a much more pronounced spiciness. In the mouth it starts out honey sweet, with rich dark berries. Slowly a peppery character comes through with a hint of sourness that balances out the sweetness perfectly. The finish is long, soft and warming, with more gentle lingering smoke. It’s astonishingly smooth, and hard to put down. Water drives the fruit away from the flavour, although the underlying sweetness remains. If anything, the finish lingers even longer, gentle and warming and still amazingly smooth. Water really takes away some of this whisky’s depth, so it’s one to enjoy straight. Dangerously drinkable and phenomenally flavoursome, this has become one of my favourite whiskies and comfortably earns 5 stars.